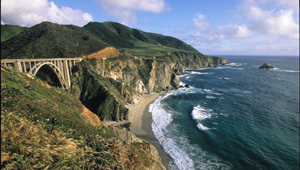 The historic and much-photographed Bixby Bridge along California Highway 1 marks the northern gateway to the scenic Big Sur coast. Just south of the bridge lies Brazil Ranch, 1,255 acres of rocky shoreline and rolling hillsides that have been featured in countless travel articles, print advertisements, and TV commercials. Once scheduled for sale as nine development parcels, the ranch was purchased by TPL in 2002 for addition to Los Padres National Forest. The project created an 11-mile stretch of permanently protected coastline between the bridge and Andrew Molera State Park.